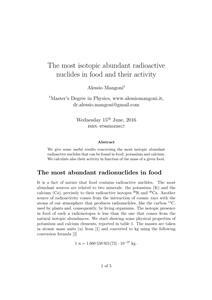 We give some useful results concerning the most isotopic abundant radioactive nuclides that can be found in food: potassium and calcium. We calculate also their activity in function of the mass of a given food. Author: dott. Alessio Mangoni, master's degree in physics.